Successfully Added Smart Rugged Phone - Android 7.0, Finger Sensor, 3300mAh Battery, Waterproof, IP68 Rating, 5 Inch HD Display (Black) to your Shopping Cart. The phone will be safe and secure in water because of IP68 rating. With the IP68 rating, you can take this phone anywhere. Huadoo has designed and produced a phone that will make your life easy. The rugged cell phone has an Android 7 operating system that will allow you to access the latest apps and games from the Google Play Store. The phone has an IP68 rating that will keep it protected from dirt and water. The phone has been built with top-quality materials to be able to withstand a fall. It is a great choice for people who love traveling. Huadoo HG11 phone is capable of capturing crisp and bright photos thanks to its 13-megapixel rear camera. The 5-megapixel front camera will enable you to take great selfies. 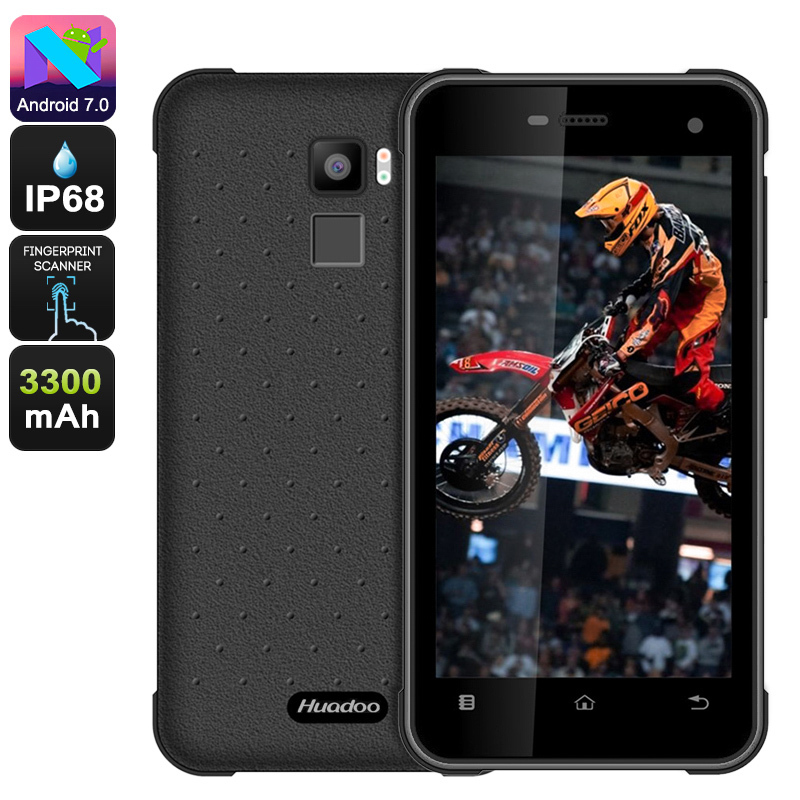 The phone features a 1.3GHz processor, 3GB RAM, and Mali-T720 GPU. 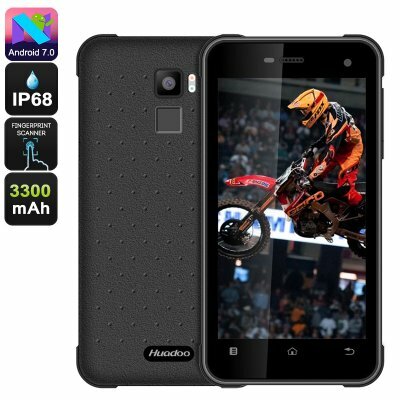 This makes the phone capable of multitasking without any lag and plays heavy games without the phone heating up. The phone will keep you entertained no matter where you are. The waterproof phone has a huge battery at 3300 mAh that will last for 5 hours and standby time up to 80 hours. You can enjoy your favorite media on a long journey with a single charge. The internal storage capacity can be expanded with a microSD card up to 128 GB. This will allow you to store unlimited pictures, music, videos, notes, and many things. The rugged phone has numerous media format including MP4, MP3, JPG, GIF, PDF, and many more. It has a 3.5-millimeter audio output port and a micro 5 PIN USB data. Furthermore, the screen size of the phone is 5 inches with 720 x 1280 resolution. You can easily read large texts and enjoy your favorite media on a large screen. This phone has 2 SIM slots and 2G, 3G, and 4G network support. You also have the great security with the fingerprint unlock support. In addition to this, it has many sensors like proximity sensor, gravity sensor, an optical sensor, and an acceleration sensor. The Wi-Fi support and 3G/4G connectivity make it easy to have access to the internet anywhere in the world. The Bluetooth connectivity enables you to share media with others without any difficulty. The Huadoo HG11 rugged phone comes with 12 months warranty, brought to you by the leader in electronic devices as well as wholesale rugged phone and smartphones gadgets..